Talk about a stunner piece! When I saw this floral jumpsuit by Amuse Society at Mimi & Red Boutique in North Park, I knew I had to get it! Is it out of my comfort zone? Yes! Is it kind of hard to pull off? Hell yes! 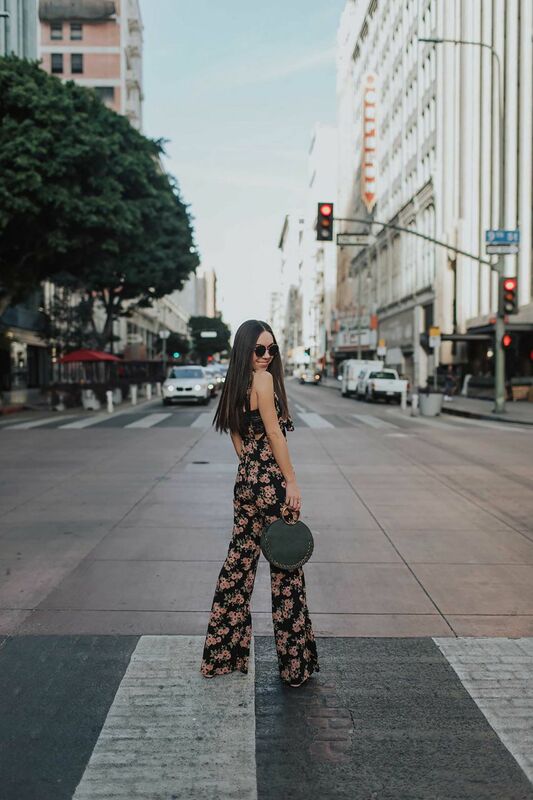 But I’m telling you, it’s worth all of the hassle because I feel like a flower child hippie meets urban fashionista stopping traffic in DTLA. Since this jumpsuit screamed flower child to me, these pink platforms that I already had in my shoe collection came to mind immediately. Honestly, I have no idea what kind of shoes I’d wear with this jumpsuit if I didn’t own these pink platforms. It feels like they were made for each other, no? The faux-fur jacket had to be a part of this look since you guys know I don’t even go to the grocery store without a faux-fur coat on nowadays. 🙂 If you follow me on Instagram, you know my obsession with faux-fur jackets this winter.